PrepLadder congratulates Dr. Vaibhav Karoliya on securing Rank 15 in NEET PG. We wish him all the best for his career and future ahead. 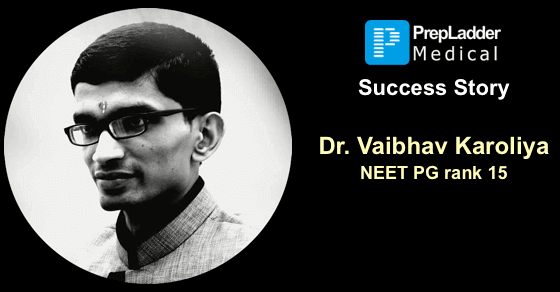 In this exclusive interview with PrepLadder, he shares the plan that worked for him to help you succeed in NEET PG. My name is Vaibhav Karoliya from Morbi, Gujarat. I did UG from B J Medical College, Ahmedabad. I had joined MBBS with 2nd rank in State Merit. As a UG student, I managed to score around 70% marks. However, attaining a grip over the basic subject fundamentals in UG helped me a lot for better PG preparation! I didn’t join any coaching classes for my preparation and just relied on online test series. What do you think is the correct approach to study for NEET PG? Only MCQ's or Theory + MCQ's? MCQ as well as Theory both are vital. It’s like batsman and bowler of Cricket and Attacker and Defender of Football. You can't afford to skip either of them if you want to win. The list of most important topics is available on the Internet. Use GOOGLE or portals like PrepLadder for such purpose too. Kalam DNB Appendix itself serves as the list of important topics! Use it, study those topics from textbook and then solve PAPERS of that subject. Solve questions which are not covered while preparation and study the explanations for such questions. Take subject-wise tests and repeat the same process for unknown topics and questions. Know the areas where you commit mistakes and take note of the questions or areas where you often commit mistakes. The preparation should commence as early as possible, however, it's never too late. First and Second MBBS students should focus on clarifying concepts and remembering facts for long term, not only till writing theory exams. Nonetheless, since these are the days of early college freedom, most of the students merely manage to pass exams. However, good PG preparation can be done by without "wasting" the so called Golden period of MBBS. You can go for MCQ oriented preparation from the Third year of MBBS. Buy MCQ books and start practicing MCQs on the topics you study. Prepare High yield notes based on MCQs asked and what you feel important while preparation. Self made notes serve best if properly made and utilized!! Notes should be of 10-25 lines per topic. Take note of easily forgetful things such as Numerical or Special names. For Instance: Kanagawa phenomenon. Correlate things and compare related topics and note their differences on a chart. For example: Pemphigus Vulgaris and Bullous Pemphigoid. Strive to remember and distinguish between confusing names. What to do before starting serious preparation before internship? Purchase DNB and NEET papers with explanations. Select one subject at a time and start practicing all its MCQs from the papers and also study explanations. Keep subject wise books aside for quick reference while practicing MCQs and take note of the topics which were frequently asked in the previous exams and enlist all such topics in the descending order of their weight age from the previous exams’ point of view. After solving a particular subject’s questions from previous NEET and DNB papers, prepare the topics from the MCQ books and practice a lot of MCQs of that subject from different competition books and refer theory for unknown questions. Take pictures of high yield charts and tables which will facilitate easier revision at a later stage. Attempt subject-wise tests and analyze your performance after each test. Take note of your weak areas and strive to overcome your weaknesses. Repeat the same procedure for the other subjects. Here is the list of books which I followed for a holistic PG preparation. However, studying the same books as toppers is not essential. We wear clothes as per our comfort and not just attractive and well designed. The same applies to preparation. Toppers might state that they referred Harrison, Robbins, etc. However, you might not be able to complete such heavy books in time. It’s obviously good if you read these books in UG, however, it’s not bad even if you didn't. You can refer to text books whenever doubt arises, otherwise, MCQ books prove good enough. Nowadays, subject specialist books are available for each subject. I didn’t give PGI because I was not good at handling "multiple options"
Ideally, you get time to revise only 100 pages for big subject and 30-40 pages for the small ones! In First round of preparation, convert your book size into at least 200 pages and to 100 pages in next round! This is approx. Varies with subjects and you! Suppose preparing Peptic ulcer, we know most of risk factors and antibiotics names, therefore, these does not require revision. However, Graham patch, H pylori tests, toxins, stains may require revision as newbies! Use your UG knowledge very well here, skip what you already know! Also skip such things which you think you will not remember even after revision and will not be asked such as survival rate of cancers, staging of less common cancers, origin and insertions of muscles of hand and sole. Reading the same page for hours will not help, however, revising it after week may! Therefore, dedicate one hour in the end to revision every day! Spare Sunday for weekly revision! Ultimate goal should be to keep content fresh to ensure that when you revise, it should not be like first reading. Subject-wise Tests should be given readily after that subject is over! No one can make it without test practice. Time management only comes with that! Silly mistakes fade away with practice only. Reading only without giving tests is like learning driving just by watching videos and not actually going to the road. Once you are done with all subjects, start GRAND TESTS preferably in September, take at least 20 full length Grand Tests. 70-80% score is good enough depending on difficulty of paper! And those who top in NEET up to 500 also score nearly 220-240 approximately! Did PrepLadder play a role in your success? If yes, how? It can surely sharpen your AXE since it's used by many aspirants and since it provides the same software platform as the NBE therefore, it provides a very similar atmosphere like the real exam! PrepLadder conducts ALL INDIA FREE MOCK TEST before AIIMS and NBE exam almost every year which helps you to test yourselves prior to the actual exam and let you know where you are standing right now! Difficulty level and Question format of the Test Series are also similar to NBE pattern which makes it the best choice to practice in simulated environment. We usually get 8-10 calendar months to prepare for first attempt in PG entrance. And we have 20 subjects to study and revise them too. 2-3 revisions are at least required depending on your memory or more if you think so. Single round of preparation must be completed at any cost by 6 months!! I did not adhere to any strict timetable. However, I ensured to study 80-100 pages of guidebook daily depending on subject. I followed a mix of Theory plus MCQ to avoid getting bored. MBBS mark sheets have nothing to do with PG results, however, your fundamentals have! Avoid wasting time in controversy! Such questions are only 2-3 in paper and no guarantee of correct answer even if you explore Google as a whole!!! Your goal should be not to compete with others but with your past performance. Avoid non-productive surfing of FB pages. Don't read too many books for one subject, as we have 20 subjects! Don't take same time for revision, no use of it. Revise quickly from your notes. Most of toppers advise to stay as far as possible from controversy. Refer to standard text books if anytime in doubt and go with teacher you believe in case the doubt still persists or follow more prevalent belief as last resort! Some questions are time wasting, come very infrequently in the exam and even if they come, it rests on NBE what's correct answer they think. Most of people start like ODI, initially with power play and then they get stuck into middle overs! It's always essential to maintain tempo throughout. Get yourself surrounded by people who motivate you to put in more effort and not just pump with you EXTRA AIR. Healthy Group Discussions for limited period helps to understand difficult topics and mutual motivation by creating PEER PRESSURE! GD will also help you updated with anything which you might have missed. Even if you are mediocre during UG days and haven't open Harrison or Robbins, still you can achieve a good rank in PG through right path, proper preparation, timely revision and immense test practice!! Develop familiarity with subject wise mark distribution and exam software etc. However, don't waste time in understanding Prometric marking system!! As Lord KRISHNA has said, "You should work only, Let me tell the result to you". Just Remember you exist here only because you were the fastest and strongest SPERM !! Forget about probability, Believe in your ability. You can read me at http://stethosays.blogspot.